Super File Manager is the PUP that uses misleading techniques to prevent removal. Use Reimage to locate malicious components and get rid of them faster than with uninstall instructions. A full system scan blocks virus reappearance and prevents traffic to malicious domains. Super File Manager is a doubtful “full-featured file manager” for Android devices developed by Onegogo. Based on its distribution (“bundling”) and intrusive behavior (intrusive ads, resistance to removal), it has been included in the potentially unwanted program (PUP) and adware categories. Removal Manual removal possible. A guide provided below. Those who cannot eliminate Super File Manager manually should download Reimage Cleaner or another anti-malware for Android. Without an in-depth analysis of the Super File Manager adware, the app might seem useful and reliable. It is available at superfilemanager[. ]com and Google Play Store as a high-ranked file manager. It boasts being able to sort files in categories, allows viewing files by type, enables fast file transferring across multiple platforms, and so on. Experts warn that Super File Manager virus is not a reliable application. It is usually distributed via freeware and install “Doctor Clean,” “Super Locker,” and other potentially unwanted programs alongside. According to people's reports, all these apps are alike regarding design and performance. Each of them is or may be used for promoting APUS apps. 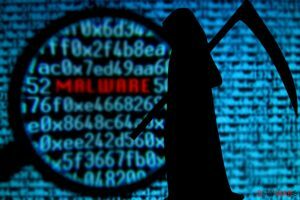 Besides, cybersecurity experts warn that the Super File Manager malware can be pre-installed in some of the infamous Chinese Android smartphones. People who found this manager installed out of nowhere and cannot initiate Super File Manager removal because it keeps reinstalling should check the list of installed apps and look for suspicious entries like “fqad.” Apps developed by Cheetah Mobile or DU Security Labs can indicate the presence of malware either. We may provide links to third-party Web sites, such as Facebook, as a service to our users. The Site may also carry advertisements from other companies. Experts warn that apps that keep coming back after removal are a sign of Android virus. Adups malware scandal should also be taken into account when Adup android models (5.x Lollipop, 6.x Marshmallow or 7.x) have been infected by spyware and other malware. 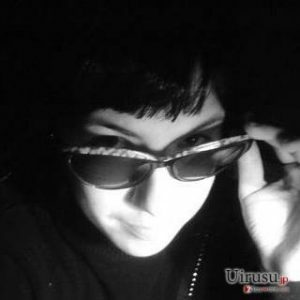 Therefore, in case of continuous Super File Manager pop-ups and the emergence of suspicious apps on the system out of nowhere, security experts from udenvirus.dk recommend scanning the system with anti-malware, such as Reimage Cleaner. However, Super File Manager removal might not be sufficient to clean up Android thoroughly. You may need to try a factory reset to delete inbuilt malware and eliminate unwanted apps from the system. In some cases, people may need a firmware re-flash. 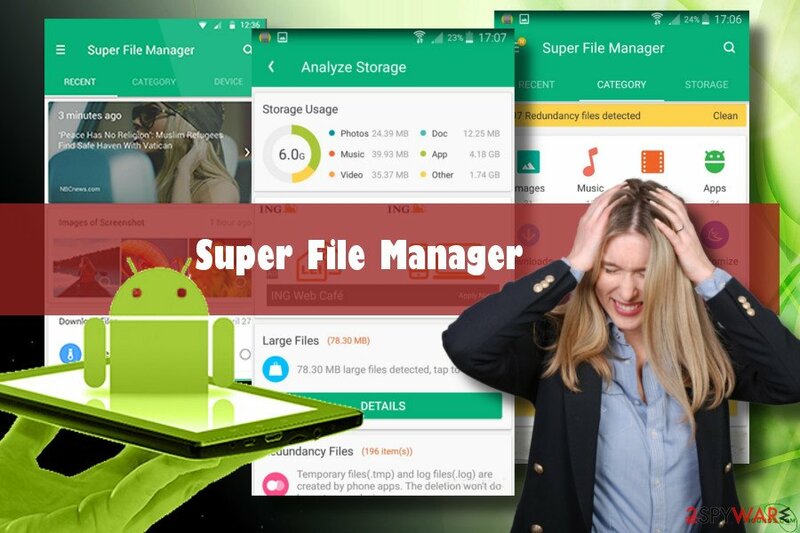 Super File Manager is a misleading Androids file manager that falls of the PUP category due to suspicious or even misleading activities, including delivery of intrusive ads and data leakage. Personal Information includes your geographic location information, names, physical addresses, email addresses, telephone, fax, SSN, information stored within your devices and other information you transmit or receive using an Application, the Service and the Site which identifies you or another person. Typically, Android malware can be eliminated manually via Apps. However, if you cannot remove Super File Manager because it keeps reinstalling, you should download Reimage Cleaner for Androids and run a full system's scan. Super File Manager removal might fail because other malware remains on the system and reactivates a manager's remnants. If you opt for trying to fix your Android manually, we'll provide a step-by-step tutorial at the end of this article. This particular rogue file manager is known for spreading via software bundles. It's currently unknown what particular programs are carrying this tool. However, it's a fact that you can accidentally download it without being notified from untrustworthy download sources. To block its entrance via freeware, you must read the terms of installation and select Advanced or Custom installation option if an option is provided. However, it's important to stress the fact that Androids, especially no brand Androids manufacturer in China can come with malware pre-installed. In this case, you may need to flash the firmware or at least reset factory settings. It's currently unknown whether Onegogo offers an adapted version of Super File Manager for Windows PCs and Macs, but just in case you would get attacked by an altered version of this manager on a different platform, you can rely on Reimage tool for help. Open Settings on your Android. Navigate to Apps Settings or Apps section. NOTE: Other phone users might need to follow this path: Settings > Device > Apps. In the list of installed apps, locate Super File Manager and tap on it. Click Disable button on the Application info (or App info) window. To confirm the selection, click Disable button again. Do the same with Doctor Clean, Super Locker, and other unknown or suspicious applications. Scroll down to the bottom of the Settings menu and tap System. Tap Reset options and select Erase all data (factory reset). Scroll down to the bottom of the page and tap Reset phone button. Finally, tap Erase and wait for the process is being executed. Scroll down and tap General management tab. Select Restart and press Factory data reset. Scroll down and tap Reset button. Enter your PIN and press Next. Finally, select Delete all to start resetting. 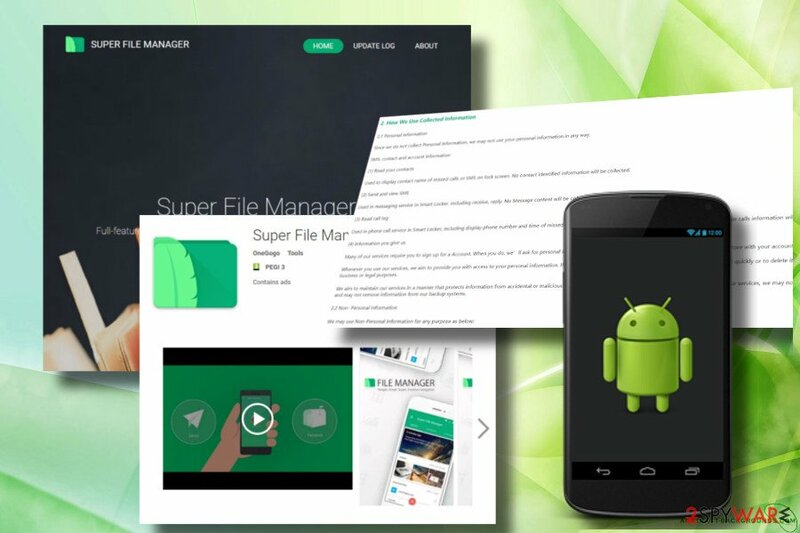 If after all, you cannot get rid of Super File Manager, you may need help from the experienced technician that could flash your Android. ^ Danny Palmer. Android malware found inside apps downloaded 500,000 times. ZDNet. 247 news coverage and analysis of the trends. ^ Apus System. Apus System. The official website. ^ Swati Khandelwal. Pre-installed Backdoor On 700 Million Android Phones Sending Users' Data To China. The hacker news. Cyber security news. ^ Kyle Wiggers. How to keep yourself safe from Chinese spyware on budget Android phones. Digital Trends. The latest news, fun product reviews, insightful editorials, and more. ^ Udenvirus. Udenvirus. News on the latest events in cyber world. This entry was posted on 2018-03-29 at 04:28 and is filed under Malware, Viruses. You can quickly scan the QR code with your mobile device and have Super File Manager manual removal instructions right in your pocket. How did you remove Super File Manager?